On Friday, June 9, Chicago Shakespeare Theater celebrated the culmination of our 30th Anniversary Season with GALA 2017, raising a record-breaking $1.74 million for the Chicago Shakespeare in Classrooms and Communities program. Four hundred and fifty of Chicago’s civic, corporate and cultural leaders were given an exclusive first look at the Theater’s dynamic new performance venue, still in-progress — The Yard at Chicago Shakespeare. 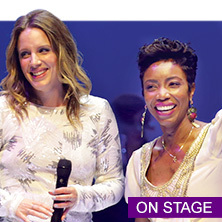 In a star-studded performance by Broadway talents Jessie Mueller and Heather Headley, audiences were treated to selections including Mueller’s “Beautiful” from Beautiful –The Carole King Musical, Headley performing “Home” from The Wiz, and a mash-up duet of “Too Beautiful for Words” and “What About Love?” from The Color Purple. Chicago Shakespeare in the Parks, now approaching its sixth summer tour, connects with Chicago neighborhoods through a grassroots outreach team. Over the years, the Theater has cultivated a network of hundreds of individuals and organizations that help us increase audiences and build awareness for the program. One vital partnership is through CAPS (Chicago Alternative Policing Strategy), which brings together police officers and teens to promote the free Shakespeare performance in their local park. 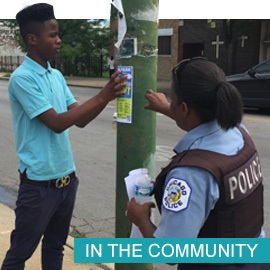 Officer Claudette Knight partnered with Chicago Shakespeare staff and a team of young adults to spread the word in the Englewood neighborhood. It’s time to bring the whole family to Navy Pier for this year’s summer musical, Madagascar – A Musical Adventure! Based on the DreamWorks Animation motion picture, this wild and wacky musical follows Alex the Lion, Marty the Zebra, Gloria the Hippo, and Melman the Giraffe on an unexpected journey from Manhattan to the exotic island of Madagascar. 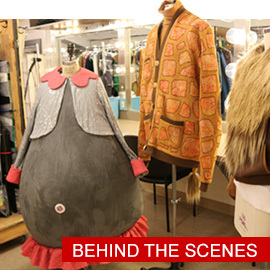 To immerse the audience in this imaginative world, costume designer Jesus Perez collaborated with Chicago Shakespeare’s talented costume and crafts team to create our theatrical version of the animated classic. This fall, CST hosts the largest production of the inaugural Chicago International Latino Theater Festival, Amarillo, from October 17 to 29 in The Yard. 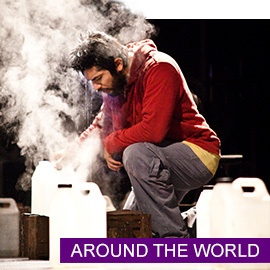 Crafted by one of Mexico’s most celebrated theater ensembles, Teatro Línea de Sombra, the critically acclaimed play explores the journey of a man who departs Mexico for a land of dreams: Amarillo, Texas. Far away, a woman reconstructs his journey, imagining what might have transpired not only for him, but for the thousands who have taken the same path. Told through projected images, monologues, movement, and a collage of atmospheric settings, Amarillo is part of this year’s World Stage series. 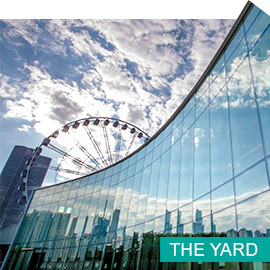 Since breaking ground 15 months ago, The Yard at Chicago Shakespeare will open to audiences this September. Its innovative design will adapt to each production’s unique artistic needs and engage audiences in surprising and provocative ways. From an economic standpoint, The Yard’s sustainable and adaptive design repurposes components of the venue formerly known as Skyline Stage, transforming it into a world-class cultural destination. It’s been an epic journey for Barbara, Criss, and The Yard’s creative team to build the Theater’s new, third performance venue.